ST. LOUIS, Mo. (Aug. 21, 2013) – St. Louis Cardinals broadcaster Mike Shannon is recovering comfortably this week after undergoing a successful surgical procedure Monday to replace his aortic valve. The surgery, which had been planned for some time, was a complete success. Shannon is expected to make a full recovery. Shannon said through his family that he is doing well and expects to return to the broadcast booth before the end of the regular season. 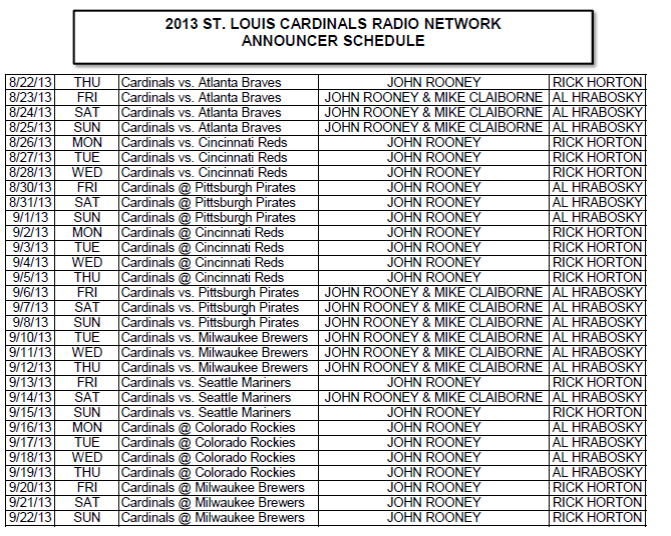 A rotation of Cardinals announcers will be sitting for Mike as he recovers. Al Hrabosky, Rick Horton and Mike Claiborne will be joining John Rooney in the radio booth through September 23rd when Mike plans to return to the booth. A full schedule is included below. Shannon has manned the Cardinals broadcast booth since 1972. Throughout his tenure as the Voice of the Cardinals, Shannon has also made appearances for the Cardinals television broadcasts, including as a pre-game analyst for Fox Sports Midwest. A St. Louis native, Shannon played for the Cardinals from 1962 to 1970, a span that included two World Championships (’64 and ’67) and a National League pennant in 1968. In 1999, Shannon was inducted into the Missouri Sports Hall of Fame in recognition of his on air career as well as his contributions on the field during his career as a player. In May 2013, Mike was named the Missouri Sports Hall of Fame’s 26th Missouri Sports Legend in Springfield, Missouri. Next Post: 44 can take you to Six Flags, but to Twelve Flags?